Did you know that Barcelona has more market halls than any other European city and that they play a vital role in the citizens’ daily lifes? 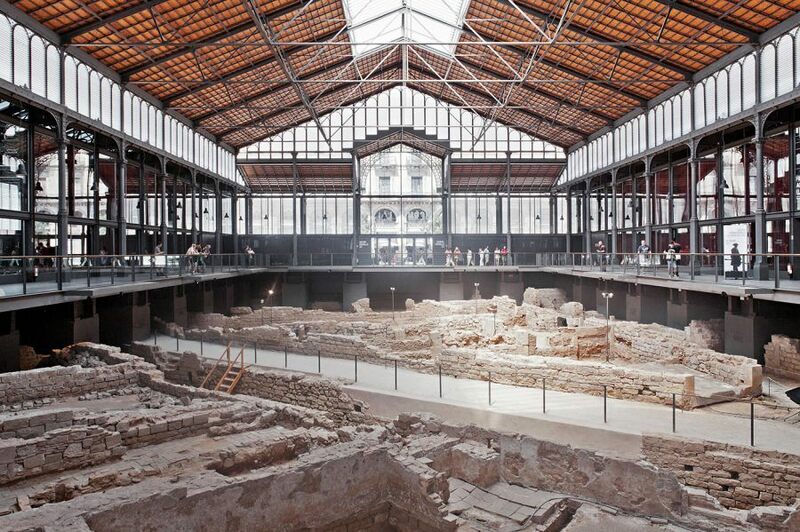 In the last twenty-five years, the modernization of Barcelona’s some forty historic market halls has been a key element for urban renewal, in fostering community and local identity. For a visceral experience of the city, there are probably no better places to visit in Barcelona than its markets. Mercat de Santa Caterina. Copyright: Daniele Ansidei. Built on the site of an old convent, the Mercat de Santa Caterina became Barcelona’s first covered market in 1848. The main purpose of its renovation (by EMBT Enric Miralles & Benedetta Tagliabue, 2005) was the urban regeneration of a run-down historic neighborhood by winning back public space and providing seniors with affordable housing. The wavy colorful tiled roof – reminiscent of Catalan modernist architecture – evokes the fresh fruit and vegetables in the market underneath. Completed in 1876, the Mercat del Born was the first example of cast-iron architecture in the city. Plans for the building to house a library were dropped in 2002, after medieval ruins had been unearthed during site preparation. Instead, the former market was converted into El Born Centre de Cultura i Memòria (Enric Sòria, Rafael Cáceres, 2013). With the archaeological remains as its centerpiece, the building is now a monument charged with heavy symbolic meaning. 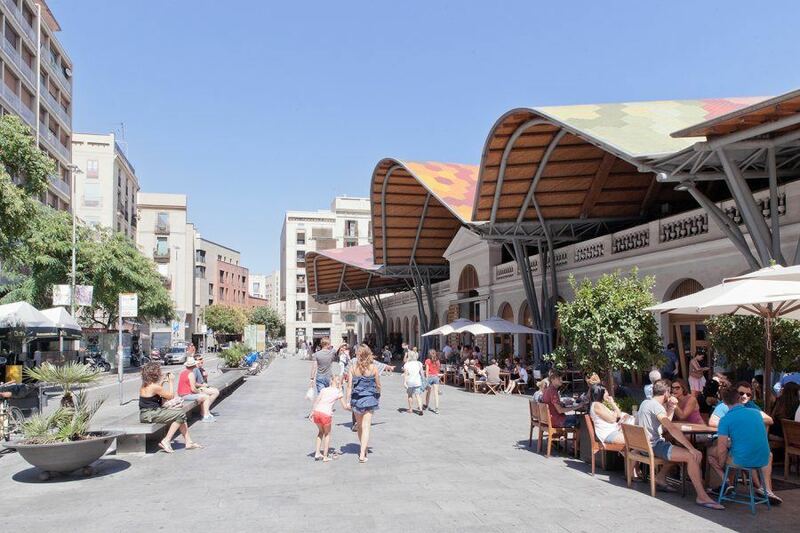 As part of the redevelopment of Plaça de les Glòries, Barcelona’s oldest flea market was moved to a new site. 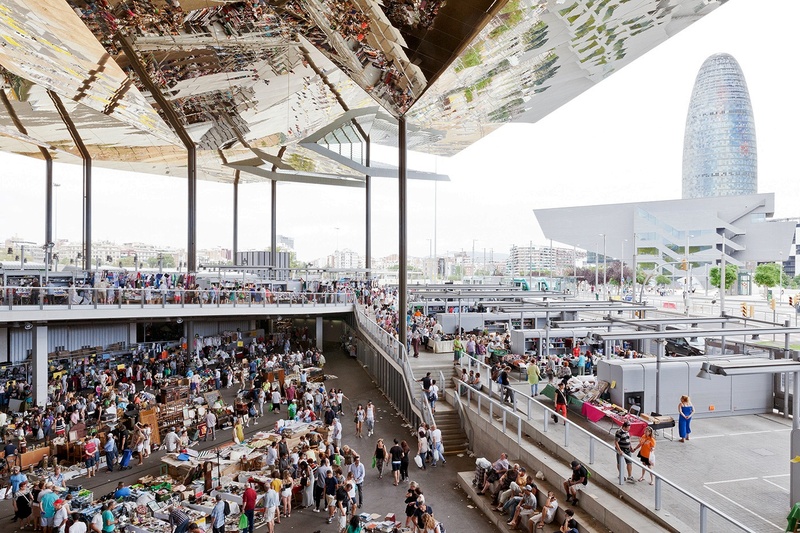 The Nou Mercat dels Encants (b720 Fermín Vázquez, 2013) was designed as an open platform beneath a giant, multifaceted canopy. Its gold mirrored ceiling reflects the busy marketplace to the exterior and the lively surroundings to the interior, turning the market into a flagship building of modern-day Barcelona. Inaugurated in 1882, the Mercat de Sant Antoni was Barcelona’s first market to be built outside the ancient walls. The cruciform construction occupies a whole block of the Eixample, making it the city’s biggest and perhaps most emblematic market hall. Another peculiarity of this building is that it actually houses three different markets, specializing in food, clothing and books respectively. A treasure trove of much-sought-after items such as stamps, coins, comic books or trading cards, the market becomes a popular meeting place for families on Sundays. 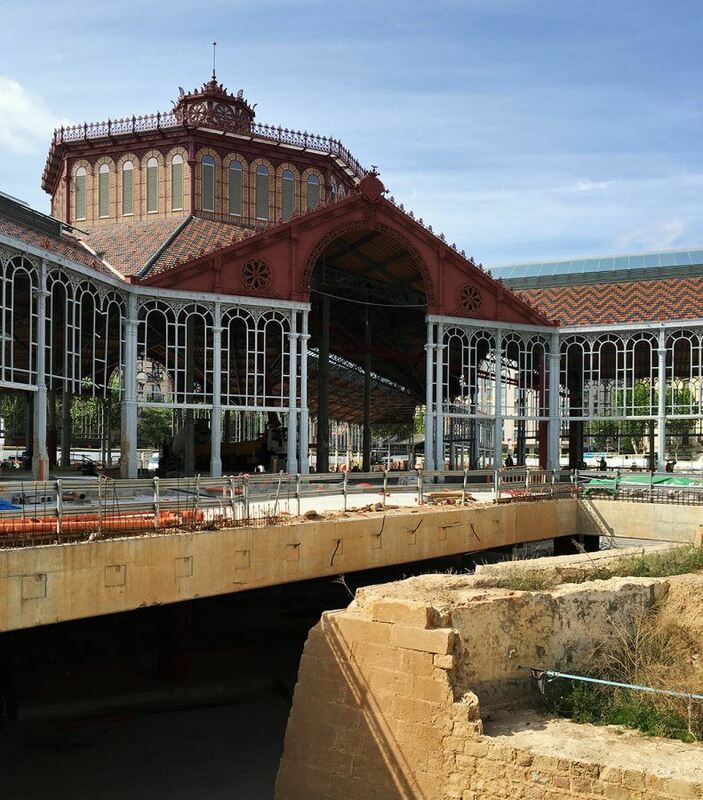 Currently undergoing restoration (Ravetllat Ribas), the Mercat de Sant Antoni is expected to reopen in 2017 and expand the infinite list of places to visit in Barcelona.